This week, the White House is singing a new tune on trade and it sounds promising. 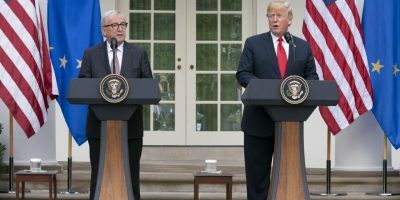 President Donald Trump, in a joint press conference with European Commission President Jean-Claude Juncker, said they were ? [launching] a new phase ? of strong trade relations in which both of us will win.? This is a major shift in rhetoric that should be welcomed wholeheartedly. The U.S. and the EU have agreed to suspend the tariffs and retaliation imposed this year, including the president?s tariffs on steel and aluminum imports. They also have put talks back on track by re-establishing a formal dialogue to further improve our trading relationship. The dialogue will focus on reaching ?zero tariffs, zero non-tariff barriers, and zero subsidies on non-auto industrial goods.? The president?s new mission aligns closely with a longtime Heritage Foundation recommendation to eliminate all tariffs on intermediate goods. Perhaps the most interesting development this week was a commitment to ?work closely together with like-minded partners to reform the [World Trade Organization] and to address unfair trading practices, including intellectual property theft, forced technology transfer, industrial subsidies, distortions created by state-owned enterprises, and overcapacity.? Although Trump did not explicitly mention China in this statement, it is clear he now recognizes that teamwork makes the dream work with trade. After months of encouragement to work with America?s allies to address concerns with China?s trade practices, Trump wants to ?join forces.? But Trump shouldn?t stop there. Establishing similar dialogues with close allies, including Japan, South Korea, Canada, and Mexico, should be an immediate priority. American businesses, workers, and families benefit when eliminating barriers to trade is the focus of negotiations, rather than threats that spur trade wars.